If you ask me, cabbage is one of the most underrated veggies out there. It’s super high in Vitamin K & Vitamin C, both of which we could all use a little more of. Plus, it’s extremely versatile to cook with and pretty inexpensive. 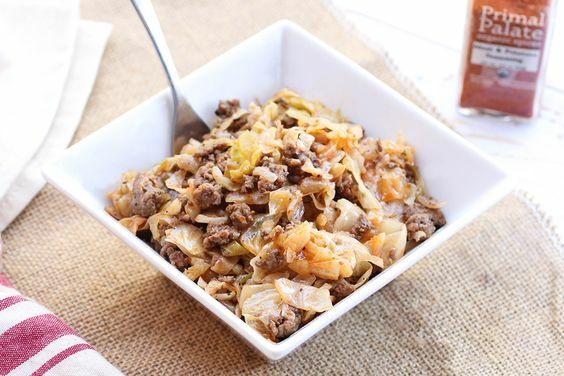 My love affair with cabbage started about 5 years ago with Mark Sisson’s Sasuage and Cabbage recipe in his Primal Blueprint Cookbook. I chose the recipe mostly because of how easy it looked but I was blown away by how flavorful the dish was. I had no idea that such a simple, unassuming ingredient like cabbage could actually prove to be both delicious and nourishing. I’ve been a huge fan of cabbage ever since and was thrilled to see the first pick of the season at the farmer’s market this week. Normally you find cabbage buried in soups or wrapped around meat (the latter being the inspiration for this recipe), but rarely do you find cabbage playing a leading role in a dish. I am on a mission to change that! 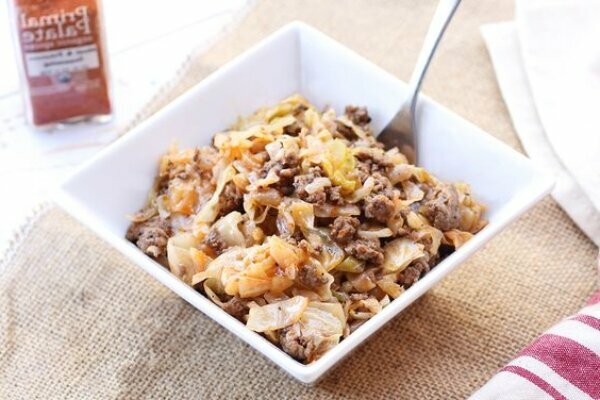 If you’re looking for something ridiculously easy to prepare that is both delicious and filling, look no further than my recipe for Deconstructed Cabbage Rolls! The best thing about this dish, other than the cabbage of course, is the Meat & Potatoes seasoning from Primal Palate. I’m not at all kidding when I say I’m already going to need to place an order for more. Definitely check out these spices if you haven’t already! Heat pan over medium heat and add ghee. When ghee is shimmering, add onion and cook until translucent. Add ground lamb and spices and cook until there is no more red visible in the lamb. Add chopped cabbage and mix well. Cover and cook for 5-10 minutes, stirring frequently to avoid burning, until cabbage is soft and fully cooked. This dish is not only terrific the first time around, but makes great leftovers as well. If you don’t have enough left over for a full meal, you can always add some additional chopped veggies or spinach. It’s also pretty darn tasty with some Sriracha drizzled on top!